I have yet to find a good copy of this. Well, overnight I finally got a decent copy of this. Sometimes it's good to have a blog. It might be known in some parts of Europe but here in North America few people have heard of it. It's also known as BOUDICA. I have this in my collection. 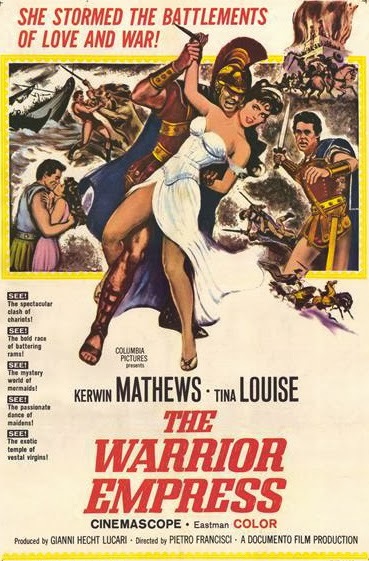 And probably the best example of this, THE WARRIOR EMPRESS is still existing in near total obscurity even after being released 50 years ago. Never released on VHS or DVD or never played on TCM. I had a copy of this from a rare TV broadcast and uploaded it to one of my Youtube channels. I removed it but someone else uploaded it to their channel, with my channel intro intact and all. Really annoying. My original upload got over 1 million hits but most people (read: men) probably just wanted to see what exactly SAPPHO THE VENUS OF LEBOS was, the title I used and added myself to the film rather than the boneheaded THE WARRIOR EMPRESS (since there is no Warrior Empress in this film). BOUDICA- This movie or something similar to it I have heard about. The reason I mention this is I saw on either the HISTORY CHANNEL or MILITARY HISTORY CHANNEL her story which to me seemed that they used actual footage from the movie. This was shown well over a year ago, and I'm sure they will show again in the future. Did you happen to see this well done movie or see the documentary?? I'm back again there are several versions of BOUDICCA available on Amazon.com and the one I was talking about has the DVDS from the HISTORY CHANNEL and the movie produced by PBS. PBS movie is supposed to be highly entertaining, but not accurate as far as historical is concerned. Another question: Do you think WARRIOR EMPRESS will ever make it to DVD on this side of the planet?? I already have BOUDICA in my collection. Columbia Pictures (Sony) owns WARRIOR EMPRESS and I haven't heard of them making any effort to release it. It would be great since Tina Louise and others from the cast are still alive. 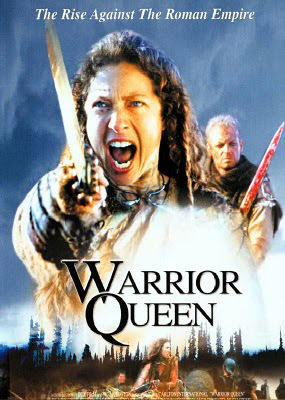 BOUDICCA/WARRIOR QUEEN Played as an installment on PBS's MASTERPIECE THEATER some years back, and it's pretty good.